Separate 3 pints of milk & make paneer out of it. Do not allow it to set. leave it in a crumbly texture & knead it well. Make it into equal rounds & flatten it. Make a sugar syrup with 4 cups of water & 1 cup of sugar. Allow it to boil to make a syrup & add the flattened paneer to it. allow it to cook in the syrup for 5 min & remove. chill it in cold water & avoid overcooking. On the other hand simmer the other 3 pints of milk & allow it to be reduced to half its quantity. 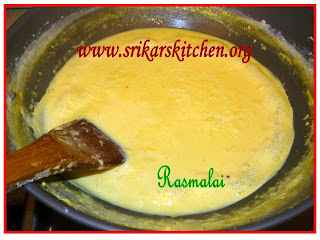 Add saffron to the simmering milk & add the rest of the sugar to the reduced milk.It is called as Rabdi. Drop the paneer in the rabdi & chill it garnished with sliced cashewnuts & almonds. rasmalai looks great sripriya.. nan ricotta cheese a bake panni panniruken.. indha method pannadhilai. 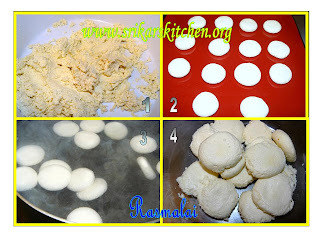 there is another short cut method using readymade rasgullas..
That looks perfect..will try it sometime. 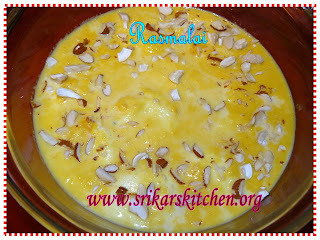 Delicious Sri...i love rasmalai..wish i have them rite now..
Lovely color. Looks yummy and delicious. I love rasmalai,I have made this using rasgullas,but never tried like this,looks mouth watering Sripriya! Yummy for tummy recipe. Looks simple by the pics. Need to try someday. Bookmarked. With those nuts and all looks die for. I made the semi-homemade version with ready made rasgullas last week! The sweet worth all the sweat! Lovely. My hubby and daughter love these. I think i should make this once and make them really happy. ooh, what a delicious rasmalai! Love it! this rasmalai looks yumm. Have tried making rasogollas before however, after they are boiled in the sugar syrup they r still hard unlike the soft and spongy ones in the sweet shops here. Will try ur rasmalai. Will let u know how it turned out. Thks for sharing the recipe. Rasamalai is my favourite... Looks awesome! Congrats on completing the RM. ooh..it my favt i love it very much sripriya..its mouthwatering me...i have bookmarked it..